Consumer markets are increasingly global, so companies responsible for producing, packaging and distributing goods have a different set of concerns than they once did. International distribution networks, for example, often bring several versions of the same product to store shelves in multiple regions, creating language and cultural considerations for sellers and their packaging partners. Regulations and codes are also different across the world, so manufacturers, packagers and logistics professionals must account for legal requirements wherever they operate. Even traditionally challenging markets are now home to greater opportunity, as in China, which recently lifted import tariffs to stimulate consumerism. As global sales channels evolve, producers, wholesalers, packaging professionals and others engaged in the consumer cycle are adapting to changing conditions. 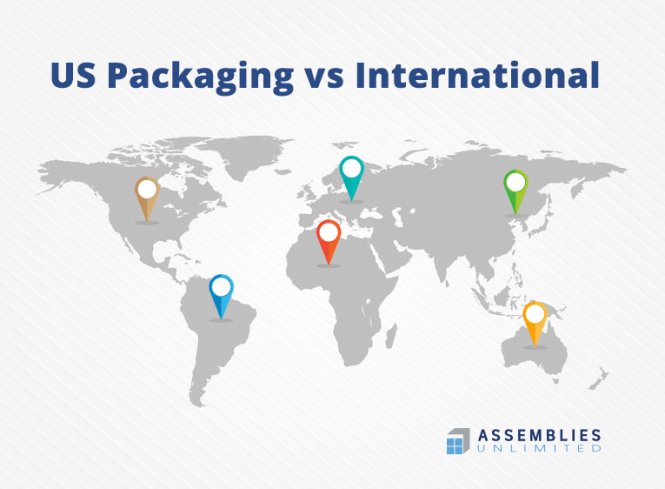 For companies breaking in to new markets, the best way to establish and maintain an international presence is to partner with an experienced, U.S-based contract packaging provider. If you are in the manufacturing or food production business, product packaging is familiar territory, prompting a very important question. Is it best for my organization to fulfill packaging needs in-house, with my own staff and equipment, or is the job better left to a professional contract packager capable of advancing our sales mission? The question looms especially large when consumer goods are bound for brick and mortar retail locations. The reason is because, on store shelves, packaging adds tremendous value in terms of marketing and passive selling power. And though multichannel retailing is well-established and growing, physical store locations play key roles for major retailers. A growing number of manufacturers are weighing the benefits of working with U.S-based turnkey packagers. For some, abandoning in-house operations moves them closer to the front lines, enabling greater variety and efficiency for packaging operations. Other companies streamline packaging capabilities to save money, freeing capital for investment elsewhere within their organizations. The following advantages are only a few of the many benefits of contracting an experienced American packaging provider. Efficient Distribution Cycle – The supply chain moves through various stages, guiding consumer goods from pre-production, through manufacture, and ultimately to the hands of end-users. Consistent success relies on a tight transition between each phase of the process, resulting in smooth supply flow and uninterrupted access to consumer goods. Delays and deficiencies at any stage can result in substantial losses from spoilage, missed sales opportunities and other negative outcomes. Top U.S. packaging firms maintain international distribution networks, enabling them to coordinate across geographical zones separated by thousands of kilometers. Using global experience and partnerships with regional logistics specialists, well-versed packaging suppliers efficiently manage timetables set-forth by producers. Compliance and Certification – U.S. packaging companies maintain a high level of international acceptance. Whether meeting production standards for sustainability or adopting voluntary food-handling oversight, domestic providers are prepared to keep projects moving, without interruption. Top packagers seek additional training and certifications from outside agencies, establishing universal global standards, above and beyond those imposed by governments and regulatory agencies. Food handlers, in particular, must meet local standards, so the best United States packagers strive toward scientifically proven best-practices, regardless of where they do business. For SQF programs and other self-inspired initiatives, U.S.-based packaging companies submit to voluntary testing, which evaluates processes and practices, as well as packaging facilities and equipment. Access to Markets – The United States represents a massive economy, accounting for a large share of the world’s affluence. Partnering with a proficient U.S. packaging provider offers access to markets otherwise unavailable. Packaging companies don’t govern import and export policies, but United States providers bring unparalleled experience to the industry. In addition to in-house expertise in marketing, merchandising, branding and other consumer specialties, top American packaging companies maintain relationships with designers and other key sub-contractors. Materials and Technology – American innovation pushes the envelope for those seeking creative packaging solutions. As materials continue to advance, creating new design options for packaging liquids, gels and solids; the most successful packaging partners embrace expanding possibilities. Better barrier technology, for example, provides protection and maintains product integrity, allowing packagers to use flexible materials in roles once reserved for rigid containers. Paired with cutting-edge machinery and methods, materials advances create a competitive edge for producers tied to American packaging firms. Companies with global aspirations must respond to a complex set of influences governing sales of their products across the world. To establish a longer reach, expanding operations must account for logistics, compliance, and a host of other region-specific concerns. Rather than expecting one-size-fits-all acceptance from international buyers, the most successful international sellers partner with packaging providers familiar with diverse, global projects. The spread of consumerism has already reached regions once left untapped. Global communications and increased logistical efficiency are partially responsible, encompassing the efforts of international producers and their North American packaging partners. India, for instance, shows signs of consumer growth, especially in technology related areas. Not surprisingly, India’s residents are quickly digitizing, so Microsoft is one of the most widely sold brands to be embraced by consumers there. On the other hand, the number-one selling toothpaste in the region, Pepsodent, hardly resonates with westerners who associate the product with the past. The brand’s current relevance and sales in India, juxtaposed against it waning popularity in the United States underscores the unique nature of packaging and marketing for global consumption. Closer to home, U.S packagers are experienced with Mexican and Canadian trade practices, facilitating smooth operations between these North American borders. In fact, experienced contractors source raw materials and supplies from neighbor countries, ultimately streamlining the flow of finished goods between regions. Growth opportunities and emerging markets draw manufacturers and distributers to diverse regions. In order to hit the ground running, successful operations lean on experienced U.S. packaging companies to ease their transition to unfamiliar markets. American packagers’ international packaging exposure and familiarity with the global supply chain bring added value to contracts, so the best choice for international producers is to partner with an established U.S. firm.